risks Archives - BetterByDesign Nutrition Ltd.
For the second time in the last few days, dire warnings about the dangers of eating certain foods and not eating others dominated the headlines. In a previous post, I addressed the Harvard-based study which claimed that low carb diets shorten lifespan. This post is about a claim made by an adjunct professor from Harvard that ‘coconut oil is pure poison’. Michels called the health claims about coconut oil “absolute nonsense” and said it’s “pure poison” for its saturated fat content and its threat to cardiovascular health . For purposes of this article, let’s first look at the (1) health claims surrounding coconut oil and then (2) the belief that saturated fat is a threat to cardiovascular health. Most of the health claims surrounding coconut oil relate to the fact that it contains Medium Chain Triglycerides or MCTs which are metabolized differently than long chain fatty acids, going directly to the liver rather than requiring to be broken down through digestion. Half (44 – 52%) of the saturated fat in coconut oil is a specific Medium Chain Triglyceride called lauric acid . A quarter (~24%) to a third (33%) of the fatty acids in coconut oil contain the long-chain saturated fats, including mysteric (13-19 %) and palmitic acid (8-11%) and ~10-20% of the fatty acids are made up of 2 short chain saturated fatty acids, caproic (decoic) acid (5-9%) and caprylic acid (6-10%) . The remaining 10% of the fatty acids in coconut oil are unsaturated, mostly oleic acid, with a small amount of linoleic acid . There are studies using 100% medium chain triglycerides that have shown modest weight loss with use of MCT oil compared with olive oil over a 4-month period , however a study comparing coconut oil (~50% MCTs) with soy bean oil (almost all long chain triglycerides) did not have a significant impact on weight loss over a 3-month period . While the actual amount of weight loss with MCT oil may not be substantial, studies seem to indicate that it is “visceral adiposity” or “belly fat” that decreases, lowering waist circumference. Something that needs to be kept in mind is that only ~ 1/3 of the fat in coconut oil is MCT oil. Most of the fat in coconut oil is saturated fat along with a modest amount of unsaturated fat. People making “fat bombs” and drinking “Bulletproof coffee” with coconut oil while expecting the benefits reported with 100% MCT oil will likely to be disappointed. For the most part, people who add excess coconut oil to their diet as an elixir are simply adding extra energy to their diet. 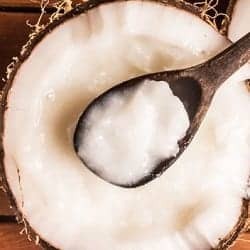 When it comes to cholesterol, there are numerous studies that have found that coconut oil raises HDL (the so-called ‘good cholesterol’) to a greater extent than olive oil, however some studies indicated that coconut oil may increase LDL (what used to be assumed to be ‘bad cholesterol’) whereas other studies have found that it doesn’t change LDL cholesterol, or if it did raise it it was in an insignificant amount. The issue is does it matter if LDL cholesterol is raised? Is a rise in total LDL cholesterol associated with an increased risk of heart disease? The basis of the claim by the Harvard adjunct professor that coconut oil is “pure poison” rests with the fact that much of the fat in it is saturated fat and that saturated fat raises total LDL cholesterol, which is associated with heart disease. But is this true? It is commonly assumed that higher total LDL cholesterol is associated with an increased risk of heart disease, but we now know there are different type of LDL particles – not all of which are associated with atherosclerosis. While eating foods rich in saturated fat, including coconut oil will raise LDL-cholesterol, not all LDL-cholesterol is “bad” . There are two types of LDL cholesterol; the small, dense LDL which are associated with atherosclerosis and the large, fluffy LDL which are protective against cardiovascular disease . While it used to be believed that total LDL-cholesterol (LDL-C) was a good proxy (indirect substitute) measurement for heart disease risk, we now know that a much more accurate measurement is the LDL-cholesterol particle number (LDL-P) which measures the actual number of LDL particles. This is a much stronger predictor of cardiovascular events than LDL-C  because the more particles there are, the more small, dense LDL there are. Another good assessor of cardiovascular risk is the ratio of apolipoprotein B (apoB): apolipoprotein A (apoA) . Lipoproteins are particles that transport cholesterol and triglycerides (TG) in the blood stream and are made up of apolipoproteins, phospholipids, triglycerides and cholesterol. Apolipoprotein B is an important component of many of the lipoprotein particles associated with atherosclerosis such as chylomicrons, VLDL, IDL, LDL – with most found in LDL. Since each lipoprotein particle contains one apoB molecule, measuring apoB enables the determination of the number of lipoprotein particles that contribute to atherosclerosis and for this reason that ApoB is considered a much better predictor of cardiovascular disease risk than LDL-C .
Is Higher Saturated Fat in the Diet Associated with Heart Disease? Recommendations for the continued restriction of dietary fat in the US and Canada is based on the enduring belief that lowering saturated fat in the diet would lower blood cholesterol levels and reduce heart disease. For the last forty years, Americans and Canadians have diligently reduced their consumption of eggs, full fat cheese, butter and red meat all because they had been told that the saturated fat in these foods would raise their total LDL cholesterol (which it does) and which will predisposed them to heart disease (not necessarily). While we know that eating foods high in saturated fat will raise total LDL levels, total LDL as mentioned above is not a good measure of cardiovascular risk. LDL particle size and ApoB: ApoA are much better predictors. Another very good estimator of heart disease risk comes from assessing triglyceride (TG):HDL ratio . It is widely accepted from both sides of the saturated fat debate that high levels of TG predispose people to heart disease, especially when associated with low levels of HDL (‘good cholesterol’). Since (1) excess carbohydrate in the diet contributes to a rise in TG level and (2) the higher the ratio of HDL is to TG, the more protective it is against heart disease, it would logically follow that including some coconut oil in the diet (which contributes to raising HDL) and minimizing excess carbohydrate (especially as refined carbs) in the diet would together have no negative impact on the risk of heart disease and likely have benefit (based on the evidence presented in previous articles). Adding excess saturated fat – whether as coconut oil or butter in the diet achieves no special benefit but avoiding it does nothing to lower the risk of heart disease risk and may even increase it. Coconut is not “pure poison” but it isn’t a magic elixir either. It is a healthy, natural fat rich in saturated fat with a good supply of MCT oils that can be used in moderate portions for cooking and for raising the ‘smoke point’ of butter when used in cooking (keeping butter from burning when heated). It’s time to stop vilifying saturated fat which is based on proxy measurements of total LDL cholesterol and on the assumption that increased total LDL is a predictor of heart disease. We have much more accurate proxy measures and need to use them. If you would like some help known which fats you can and should eat and in what amounts based on your existing health conditions and weight management goals, I can help. I provide services via Distance Consultation (Skype, long distance telephone) as well as in-person in my Coquitlam (British Columbia) office. If you have questions on my services, please send me a note using the Contact Me form located on the tab above and I ‘ll be happy to reply as soon as I’m able. Liau KM, Lee YY, Chen CK, Rasool AHG. An Open-Label Pilot Study to Assess the Efficacy and Safety of Virgin Coconut Oil in Reducing Visceral Adiposity. ISRN Pharmacology. 2011;2011:949686. doi:10.5402/2011/949686.